I love using cleansing oils and balms to take off my makeup because they are most effective at removing makeup even waterproof ones (especially as a first cleanse). I remember when I was terrified of the idea of using oils on my face to remove my makeup as I felt it will be greasy and messy. However, I have been using oils so much now that I no longer think of the process as being greasy and messy because the results are so worthwhile. 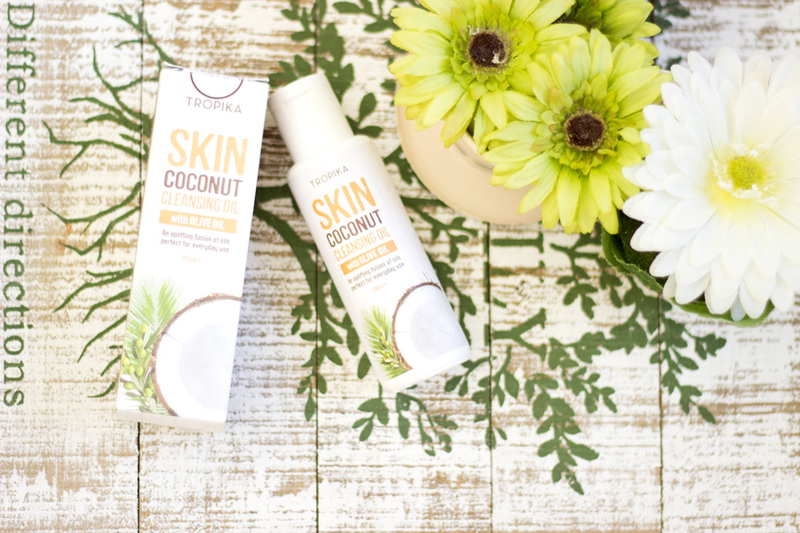 I was recently introduced to Tropika Beauty a few weeks ago and was kindly sent their Coconut Cleansing Oil*. Of course, I was excited to try it out and I wanted to share my thoughts on it on here. 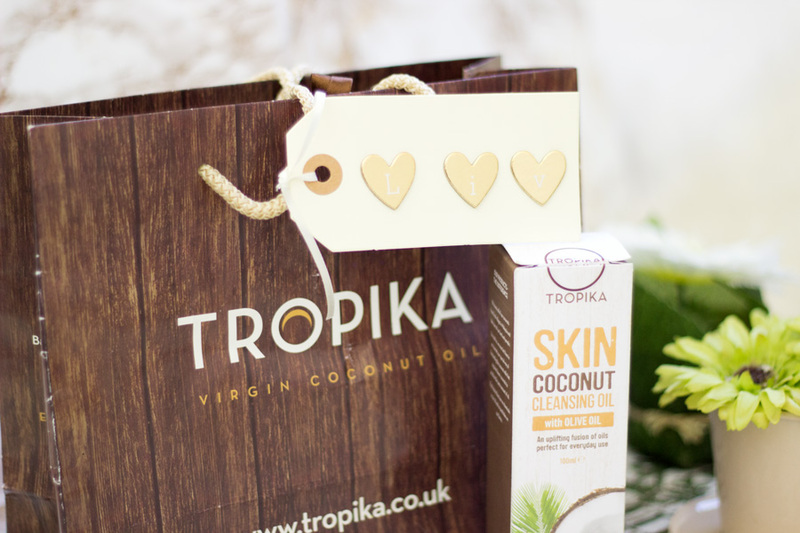 Tropika Beauty is a family founded business led by a lovely busy mother of 5 who is passionate about natural health and wellbeing. 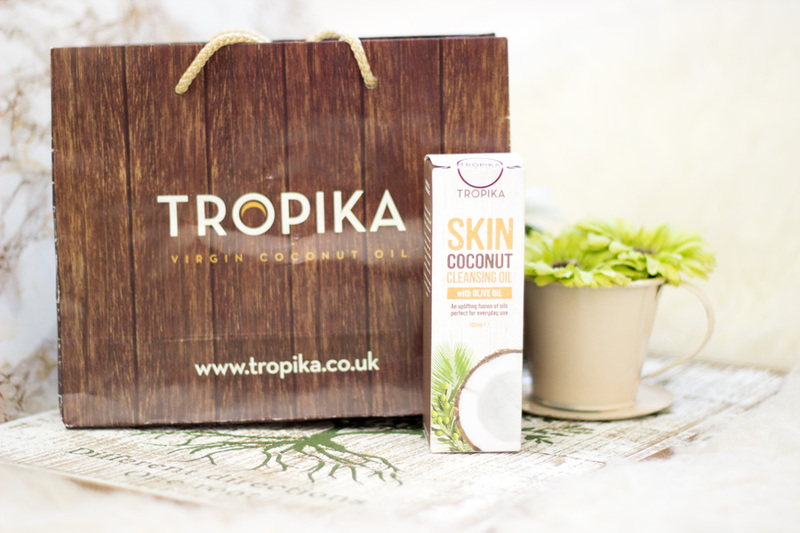 All their ingredients are sourced from natural Malaysia resources such as Virgin Coconut Oil, Olive Oil and other amazing plant based extracts. 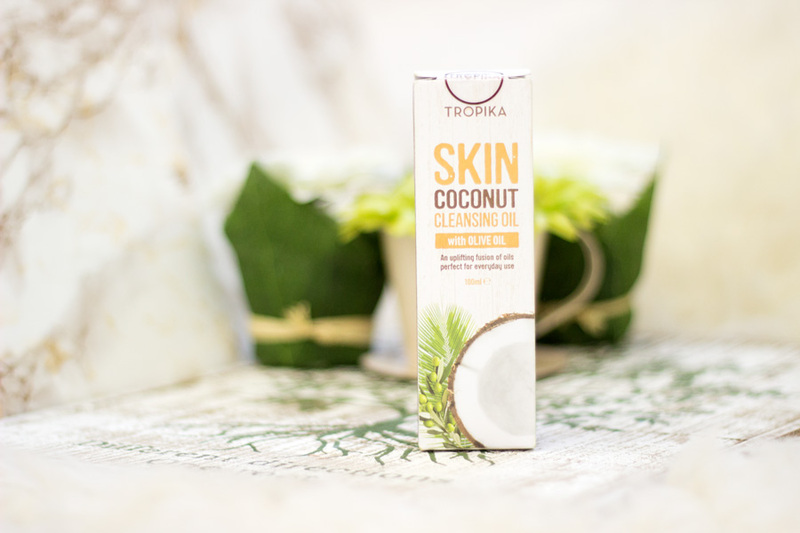 Tropika Skincare Beauty products are are made in Malaysia and they support local communities with sustainable virgin coconut oil production, taking care of the people and the land. The special thing about their virgin coconut oil is that they have a unique way of fermenting the coconut milk which means they require less coconuts to produce the same amount of oil thereby supporting the environment. You can read more about their story here and ingredients here. 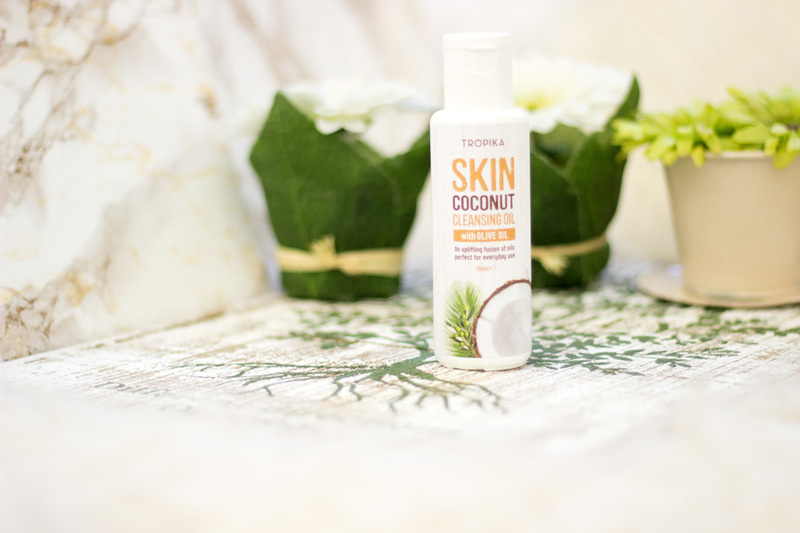 After reading about the Coconut Cleansing Oil on their website, I was looking forward to testing it out to see what makes it different to other cleansing oils I have tried. I have to say I love the packaging the Coconut Cleansing Oil came in. Granted it came in a press sample packaging but I loved the extra details. It came in the Tropika Beauty Gift bag with a tag labelled "Liv" in heart shaped buttons and I thought it was the cutest thing ever! In addition, the lovely Tropika Beauty PR kindly included a palm tree shaped key ring which I love so much and it is currently attached to my keys. It reminds me of when I was away on holiday in Barcelona surrounded by the beautiful palm trees. 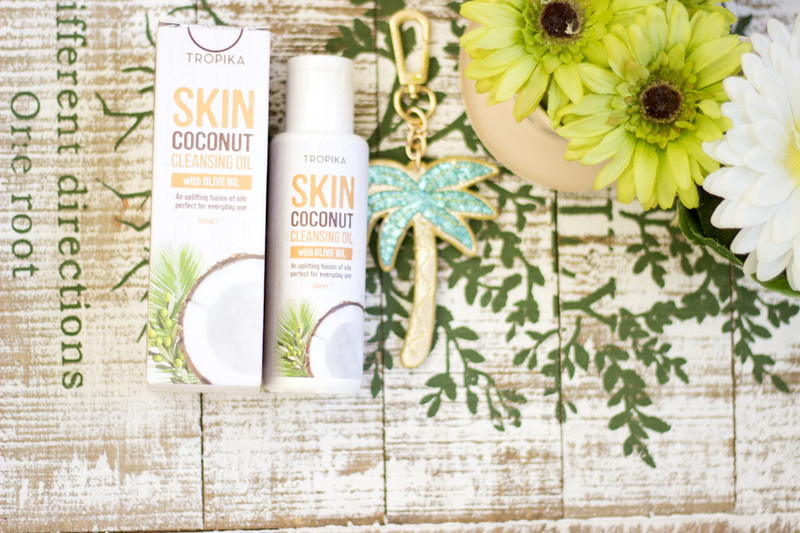 Now onto the actual packaging of the Coconut Cleansing Oil-it has an outer packaging with a tropical theme going on. This design is both on the outer packaging and the actual bottle. The outer and inner packaging have the full list of ingredients, instructions to use and details of the manufacturers which I find really useful as I sometimes throw away the outer packaging of some products. 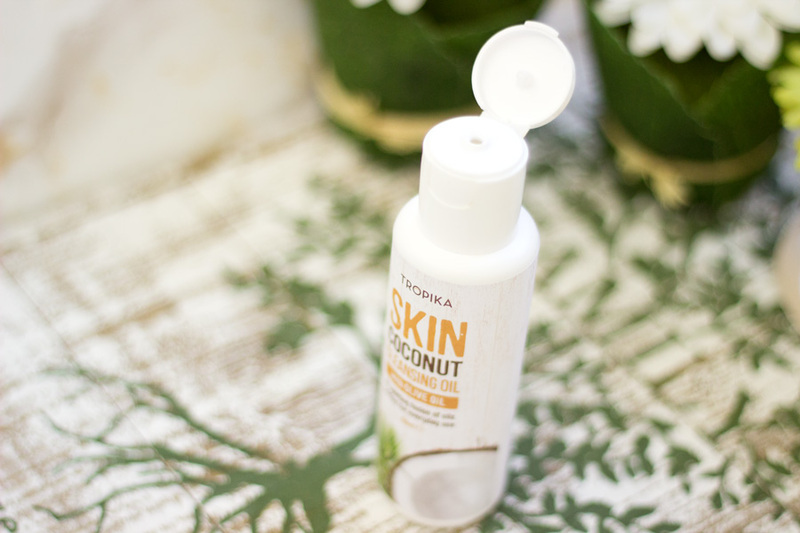 The bottle contains 100 ml of the Coconut Cleansing Oil and considering you need a little for each cleanse, I see this bottle lasting a considerable time. Initially I thought I would have a problem with the bottle not having a pump but I found that the lid, which has a tiny opening, actually works well in managing the amount that comes out. Of course, there is a danger of accidentally pouring out more than you need but I am quite careful so that has not happened. I also think the lid makes it quite secure especially for travelling. I imagined that it would contain only the Virgin Coconut Oil and Olive Oil but I was surprised that it had other ingredients including Helianthus Annuus Seed Oil (Sunflower Seed Oil) and Glycyrrhiza Glabra Root Extract (Licorice Seed Extract). As already mentioned, these ingredients are responsibly sourced from Malaysia. Due to the unique way they produce their oils, there are no chemicals in their oils and no pesticides are used on their farms. The cleansing oil smells so gorgeous and very tropical. It reminds me of a tropical juice I had when I was away on holiday so it is such a pleasure for me to use every night. It does not smell entirely of coconut at all but you can definitely smell it in this oil. I'd definitely say it is more of a tropical scented oil than a coconut one. The texture is a really lovely one as it does not feel greasy at all; it actually feels like a nice dry oil. 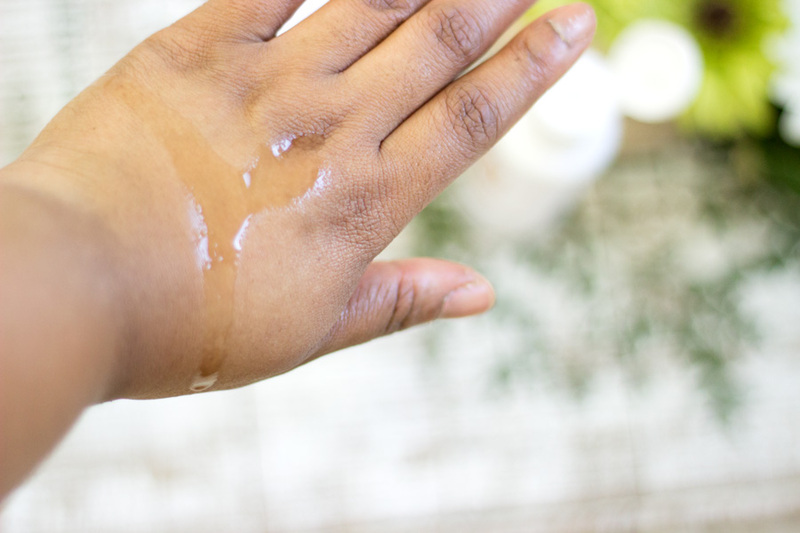 If you are scared of using greasy cleansing oils, be rest assured you'd totally adore the texture of this cleansing oil. I think the beautiful texture (and the gorgeous holiday scent) is part of the reason why I have been reaching for it a lot lately. 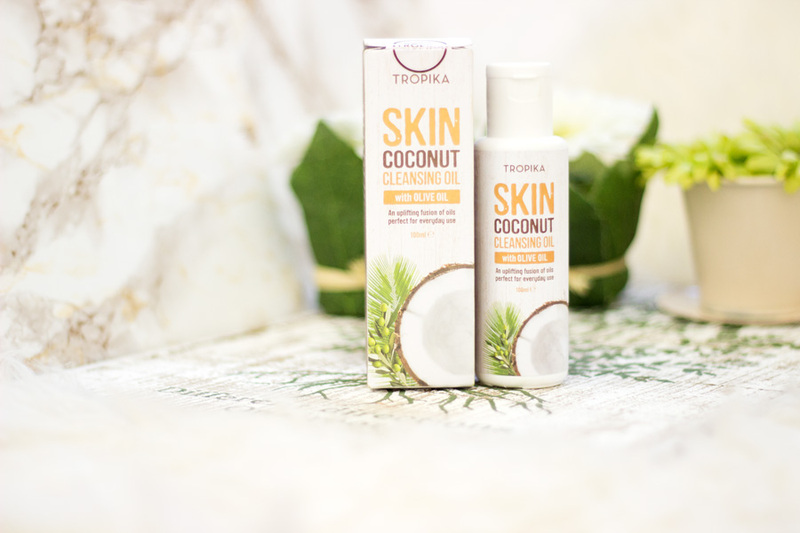 Tropika describe the Coconut Cleansing Oil as an uplifting fusion of oils perfect for everyday use. According to their website, it is a luxurious daily cleansing oil designed to effortlessly melt away makeup and lift impurities revealing a brighter and healthier looking complexion. The directions for use on the bottle recommend applying 3-4 drops to the face and adding some water to create a silky milk consistency which can be massaged to remove dirt/makeup and rinsing with water. I tried the above method and I liked it but I didn't love it. Instead I prefer to apply 3-4 drops on my face and massage it with mt hands thoroughly to lift off my makeup/dirt and then use a hot cloth (run under hand-hot water) and towel it off. I cannot even describe how amazing this cleansing oil works at removing my makeup. There really isn't any makeup residue left at all on my face but I still go back with my second cleanse. You can use it to remove eye makeup including waterproof eye makeup but I prefer using a bi-phase eye makeup remover on my eyes. I still use the Tropika Coconut Cleansing Oil around my eye area to start off the eye makeup removing process but I only do this when I wear heavy eye makeup. My face does not have a greasy film or residue after I use it and I am so pleased about that. I have used some cleansing oils which leave a greasy film/residue on my face which I find uncomfortable but thankfully I always do a double cleanse. 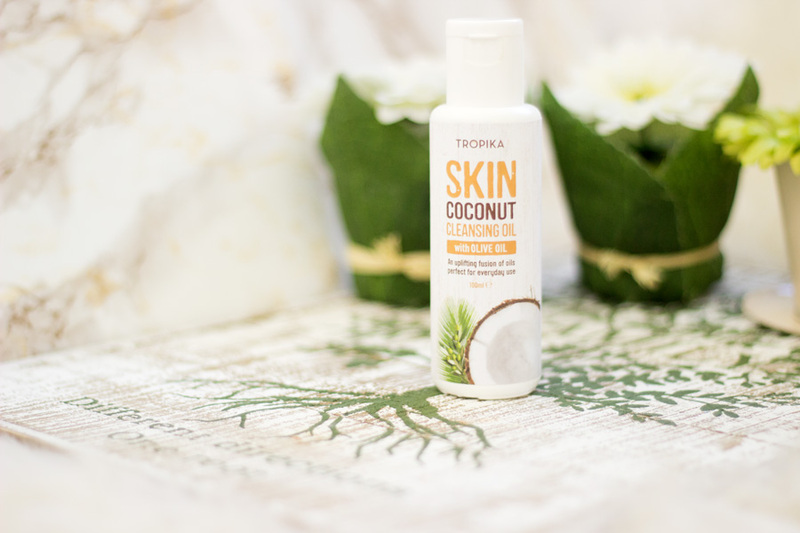 The Tropika Coconut Cleansing Oil has not irritated my skin or broken me out and for reference I have combination oily skin which is easily prone to breakouts. I already mentioned that the bottle contains 100ml of product which does not sound like a lot considering that it retails for £17.99. However, I have used it for almost three weeks straight and I have a lot left in the bottle. I only need a small amount because it is enough for my entire face and a little goes a long way (the kind of products I love). 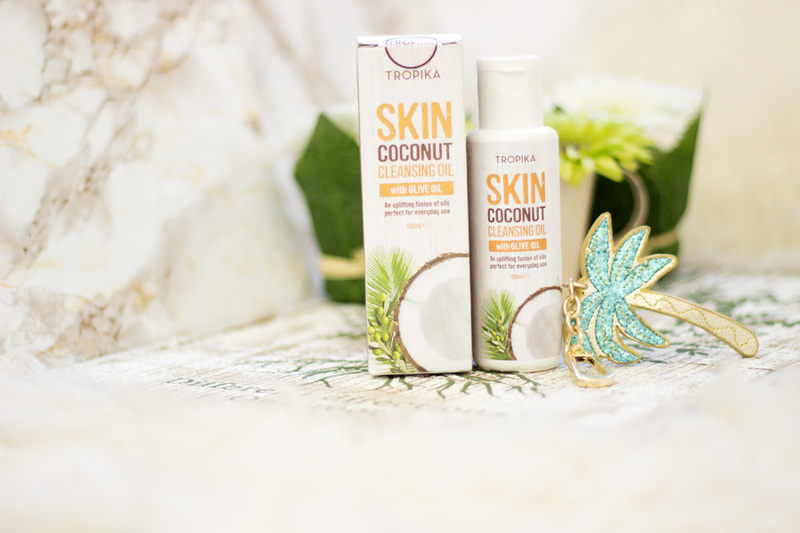 As far as I know, the Tropika Coconut Cleansing Oil can only be purchased from the Tropika website. They also have other lovely products which are worth checking out. I am just really pleased to discover another great brand that makes products with sustainable and responsibly sourced ingredients. I have really enjoyed using this cleansing oil and I am looking to compare all the cleansing oils I have tried in one post. Hope you had a great weekend and see you in my next post. 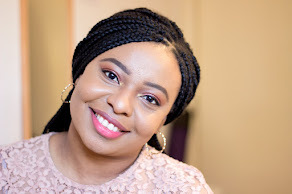 Have you heard about Tropika Beauty? Sounds like a good brand. Love coconut!